The 2018 The Lord of the Rings: The Card Game Fellowship Event brings you back to the forest where your adventures first began, but you’ll find that everything’s darker and more sinister this time around. Even you. Centered around The Woodland Realm custom scenario kit, the 2018 Fellowship Event allows you to embrace your inner Sauron and design an adventure deadly enough to frighten even the doughtiest Elves and Rangers. Then you can test your mettle by playing through it yourself—or you can hand it over to another team of players and watch them brave its many perils as you race through the scenario they hand you. Will you hunt your rivals with packs of giant spiders? Will you pummel them with trolls? Try to disorient them amid a maze of dark, enchanted locations? Threat them out with a barrage of treachery cards? Or try something else altogether? The choice is yours at the 2018 The Lord of the Rings: The Card Game Fellowship Event. 4 pm start time. $20 entry, limited seating so preregistration is recommended – MAXIMUM of 16 participants. If you have a 4 person table, there is a 25% discount if you pre-register for the event. 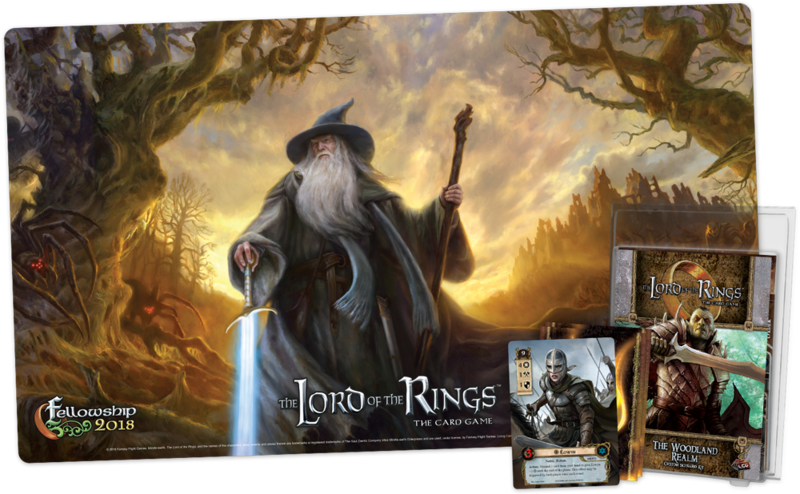 In addition, players will choose from a copy of the scenario kit, an alternate art Core Set Éowyn, and a playmat featuring Gandalf on his way into the deadly Mirkwood forest! Choice will be based on your score, OR table consensus. We are recommending 3-4 players maximum at any table, to ensure that each player gets a promotional item from playing.